One can’t live in Aurora without bumping into railroading and its culture somehow. Although well faded now, the railroad was a big part of Aurora’s history. Originally, the Aurora Branch Railroad began in 1849 and merely connected with an established railroad upriver a few miles which had trackage into Chicago. ABRR became the second railroad to serve Chicago. Within fifteen years, trackage had increased to 400 miles and the road had adopted the familiar name of Chicago, Burlington, and Quincy—often affectionately called “The Q” (one can sometimes still hear it called that in town). However, the more familiar name to most people was “The Burlington”. That appellation remained intact for over 100 years. Early on, in the steam days, a roundhouse was built between trackside and the river, and it served as a maintenance center in the system. 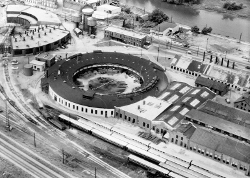 Unlike many other roundhouses of the day, it was a completely enclosed circle, rather than just segments of a circle, with a turntable in the middle, permitting repositioning of locomotives from the feeder track to individual stalls, as well as for turning (end for end) power sets. As diesel power began to dominate in the 1940s, fewer and fewer steam locomotives frequented the Aurora shops until the last steam locomotive was retired—probably by 1960. Diesels didn’t have the back end maintenance requirements of steam, and all roundhouses fell into disuse as steam disappeared. In 1970, the Burlington merged with the Great Northern to become Burlington Northern and the old silver and black livery gave way to Cascade Green familiar to rail fans everywhere. Aurora was still a railroading center, even without the steam shops. In addition to traditional management activities, Aurora was the western terminus of the commuter train line into Chicago, with dozens of trains operating into and from the city every day. When the notion of dome cars for passenger trains arose in the 1940s, the very first one built was in the Aurora shops of the CB&Q (1945). And it’s still hard to swing a cat in town without hitting a Burlington person. Well, I told you all that to tell you this: in my early days at ZAU (1973) I did some exploring around town and discovered the “Q’s” roundhouse. Totally deserted but structurally intact. I got out and walked around. The turntable was long gone, of course, and there were the typically broken windows one might see in any abandoned industrial building, but the bones were certainly intact. This is very much how it looked the day I walked around. My general impression was, “wow! Someone should make something out of this.” Well, it took years, but someone eventually did. “Sweetness” himself—Walter Payton, #34—or some investors in his name, rehabbed the building and created a restaurant and microbrewery. Which years have faded for me, but it’s not important and can be found on the internet. In any event, BN also built a new passenger terminal there, to replace the ageing facility (and former corporate headquarters) a couple of miles down river (and down track) in the south end of town. The point of this story is simply that, as an amateur historian and someone with an interest in transportation outside of aviation, I was fortunate to be able to wander around an historic derelict in a relatively brief window of time before it had been rehabbed and modernized. Boy, do I wish I’d taken pictures the day I shared the place with the ghosts of a hundred years. Fortunately, someone else did.